Here’s a “heads up” for our Forum members and site visitors. This evening, we plan to install new software for our SHOOTERS’ FORUM. As a result, the FORUM will be offline for a couple hours on TUESDAY, May 10, starting at about 10:00 pm Central Time. After the upgrade, we will activate a new URL to bookmark. The upgraded forum software will be installed on a dedicated server. This should give us improved security and stability, and it should allow the FORUM to run faster. In addition, the upgraded software has a new “look and feel” that should improve the user experience. You will still be able to use your same forum name and password. So guys… don’t freak out if you cannot access the FORUM tonight. God willing, everything will be in place within a few hours. If all goes according to plan, all existing FORUM threads and posts will be preserved — there will simply be a “time out” for two or three hours. Share the post "Forum Upgrade This Evening (May 10, 10:00 pm Central)"
SHOT Show, the “Shooting, Hunting and Outdoor Trade” Show, will remain in Las Vegas through the year 2014. That’s the good news, as the vast majority of attendees want to keep the event in Vegas. The bad news is that SHOT Show will remain in the Sands Expo and Convention Center, a notoriously bad venue for both exhibitors and show visitors. In our view, the old Las Vegas Convention Center was a far better location. What’s wrong with the Sands Expo Center? You name it. The “host” hotel is the Venetian, which is way too expensive for most attendees, not to mention a nightmare to navigate. General “front door” access is poor and there is no on-site parking at all (you have to park at adjacent hotels on the strip). The lower levels are dungeon-like with poor lighting and bad acoustics. The conference rooms are hard to find and most are either too big or too small. The Sands Center has multiple, odd-shaped levels which lack logical ingress/egress points. Floorplans are inconsistent from level to level, and bathrooms are hard to locate. Some popular sections, such as the tactical/police displays, are exiled to upper halls that are hard to reach from the main entrance. Worst of all, to get into the show, most visitors must walk a quarter-mile through the dark, noisy, maze-like interior of the Venetian hotel. It is very easy to get lost in that nightmare of a hotel. On a 1:10 scale, we give the Sands Expo Center a “3” and that’s only because it’s (barely) big enough and the main hall is bright, with high ceilings (albeit with a leaky roof). For years, the SHOT Show was held at the Las Vegas Convention Center on Paradise Road, adjacent to the Hilton Hotel. Starting in 2009, SHOT Show organizers needed to find another venue because the Las Vegas Convention Center (LVCC) was undergoing a multi-year renovation, including a 500,000 square-foot floor-space expansion. We understand why the Sands Expo was selected as a temporary replacement, despite its many shortcomings. But now it’s time to get out of that poorly-designed facility. 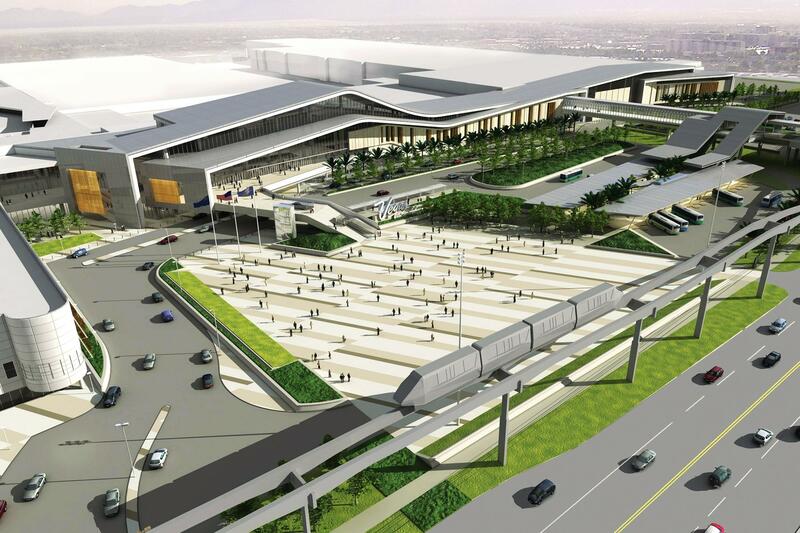 Over the past four years, the Las Vegas Convention and Visitors Authority has pumped $890 million into the LVCC. Most of the work is done, and renovations should be completed by 2012. 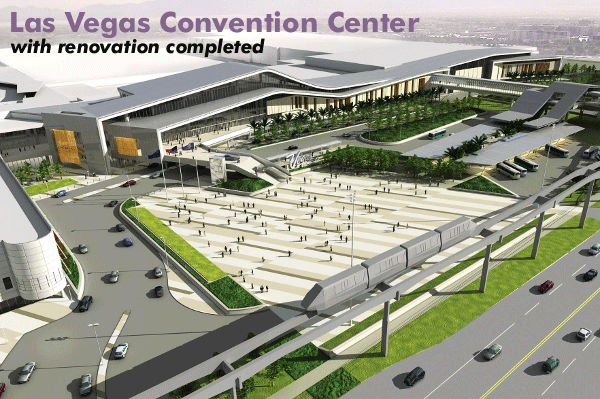 Why is SHOT staying at the Sands Expo through 2014 if the Las Vegas Convention Center (LVCC), a much better facility, should be available next year? We have no idea. We consider this a blunder of major proportions, an “epic fail” by the NSSF (owners of SHOT Show), and Reed Exhibitions (producers of SHOT Show). Perhaps the NSSF was worried that LVCC renovations won’t be completed by January 2012 — but then that still doesn’t justify THREE more years at the Sands. Maybe it was just a money thing — accepting the lowest bid. At least some effort will be made to improve Sands Expo facilities. Steve Sanetti, NSSF President, stated: “SHOT Show attendees have made it clear to us that Las Vegas is their city of choice, and this agreement allows NSSF to meet their expectations. The Sands has responded to our requests for improvements … and this was a key factor in our decision.” The NSSF reports that “improvements will continue over the next three years — including enhanced cellular service, newly renovated lobby areas and rest rooms and other enhancements.” Well, you can put lipstick on a pig…. 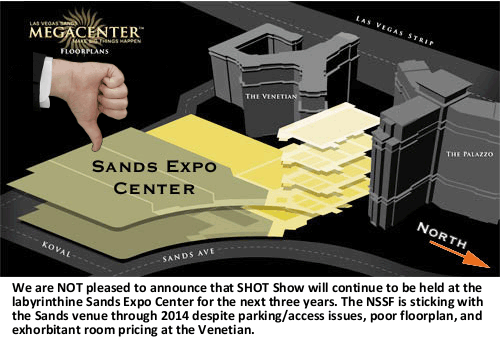 Share the post "SHOT Show Stays at Las Vegas Sands Expo Center Through 2014"